This bizarre artwork is a detail from the dust jacket of the US hardcover edition of Ngaio Marsh's 1949 mystery novel A WREATH FOR RIVERA. When I was a kid, my mother and grandmother sometimes took me to Salvation Army thrift stores in our neighborhood, where I was turned loose in the used book department while they did their own foraging and rummaging. One day, they took long enough at their shopping that I exhausted the store's supply of comics and children's books and began browsing outside my usual perimeters. A WREATH FOR RIVERA became the first adult novel I ever owned - the beginning of a life-long collection. I remember having to talk Mom and Granny into it; they said it was too grown-up for me, but something in me responded to this cover art and I had to have it. I'm sure I saw this before I ever saw Ray Harryhausen animate skeletons in JASON AND THE ARGONAUTS - and I didn't see 7TH VOYAGE OF SINBAD until its 1970s reissue - so this was the first animated skeleton, so to speak, in my experience. I remembered this old book and its cover art out of nowhere a couple of nights ago and went looking for a scan of the dust jacket. The picture isn't exactly how I remembered it - for some reason, what I told myself in memory was that the cover showed a dozen or so skeletons firing Lugers at each other - but nope, this is definitely the book that nudged me into the wonderful world of vintage used hardcovers at the age of five or six. 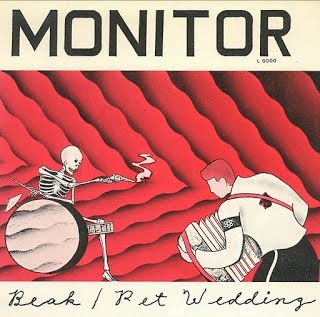 Reader John Seal writes: "You may be interested to know that LA art punks Monitor cribbed the Marsh book cover for their 'Beak/Pet Wedding' single in 1979. Great band – I saw them open for Cabaret Voltaire in late 1980."